Developed by Rampid Interactive for Windows. 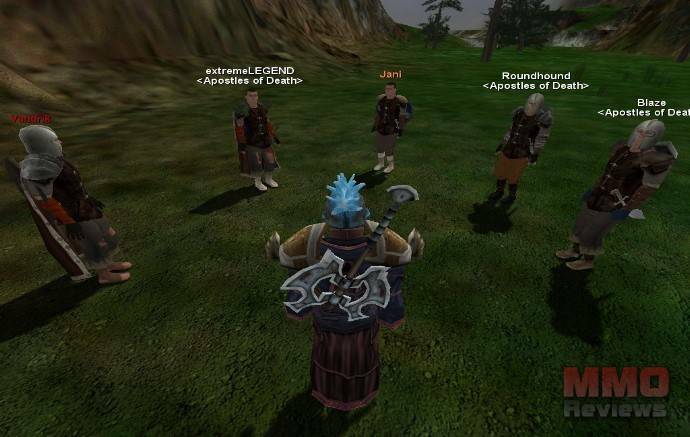 Crowns of Power is a 3D graphical online MMO. It features an extensive 3D world, filled with amazing landscapes and environments. The game world is being designed to support hundreds of players simultaneously, with the network capacity to support many game servers. Players will meet up with others from all over the world to fight side by side or opposite one another on the field of battle. Adapt and evolve in this ever changing world, where players self-govern and guide one another. Will you fight for what is just and true, or seek the ultimate desire of man in a quest for absolute power? Defining roles in Crowns of Power are established with “Force” spells that make the caster more powerful in a specific area at the cost of vulnerability in another. This is to help each school have a specific function that falls in place with most MMORPGs, like a “Tank”, Healer and “DPS” (Damage Per Second). This school of magic is focused primarily on buffing and healing themselves and group members to mitigate damage and increase their chance of survival. White does have access to damage based spells (also known as Nukes), however they’re limited in number and power. White is one of only two classes that can summon permanent “pets” (also known as minions) that help aid themselves and group members by assisting with heals. White is the only class that is able to “rez” (Also known as Resurrect – A spell/ability that is cast on the corpse of a fallen player to summon them back to it). Force of Light increases the casters healing abilities at the cost of damage output and mitigation. As is the case with most MMORPG’s, a healer is essential in any high level group/raid. This school of magic is based on the element of Fire and is used primarily as a damage dealing school. It has the highest damage output of all the spell schools and has limited utility and protection. Force of Flame greatly increases the damage output of Red magic at the cost of taking more damage from would be attackers. This school of magic is based on the elements of Nature and its command of creatures and protective spells. Green has access to the most powerful “pets” in the game that are permanent. They have the most powerful protection spells for pets, as well as some powerful buffs for group members as well. Green also has access to several “DOTS” (damage-over-time) and Direct Damage spells. Force of Earth dramatically reduces the damage output of the caster and their pets in exchange for increased physical damage mitigation and increased taunting ability, allowing them to better tank mobs. This school of magic is based on the Mind. Its primary role is to control the flow of combat by Mezzing (term used for Mezmerise - a spell that incapacitates a target for a set duration of time) and slowing their attack speed. They can also enhance group member’s intelligence, attack speed and other defensive abilities with buffs. Blue does have access to some damage spells, however its main role is as a support/utility. Force of Mind allows the caster to Mez two targets simultaneously in exchange for reduced spell and pet damage. This school of magic is based on the elements of shadow and death. Its primary role is to deal damage efficiently over time through the use of direct damage, DOTs and “debuffs” (spells that weaken the target). They have the ability to gain life through their attacks, similar to a Necromancer/Lich. Force of Death adds additional debuffs to targets with shadow effects on them, increasing the damage they take in exchange for decreased total Hit Points to the caster. Characters are not eligible to participate in PvP until they reach a minimum level of 20. Once level 20, you will be vulnerable to attacks from other players. You may also attack other players, whether they be innocent or an outlaw/murderer. To attack a player, you have to take your safety off.